The Vancouver Condo Buzz » GREAT VALUE! Richmond Alexandra Court at Alexandra Gardens Community – Master Planned Neighbourhood by Top Rated Polygon Developers! « Final 24 Rowhomes & 12 Storefronts Available at MOSAIC’s OSPREY Pitt Meadows Community > Coming Fall! GREAT VALUE! Richmond Alexandra Court at Alexandra Gardens Community – Master Planned Neighbourhood by Top Rated Polygon Developers! A new master planned condo community by Polygon is launching soon at the prime Alexandra Gardens neighbourhood. Aptly named the Richmond Alexandra Court condos by Polygon Homes, these new, urban and sophisticated residences puts you just steps away from prime retail stores, boutiques, eateries and indoor/outdoor recreational venues. As well, the Alexandra Court Richmond condos at Alexandra Gardens are very close to the Canada SkyTrain Line that can get you to downtown Vancouver within minutes. Some of the features of this boutique Richmond condos include a lush courtyard that is professionally designed and landscaped (and includes a beautiful water feature) in addition to on site security manager, air conditioning and nine foot ceiling heights in your home. As well, home buyers at Alexandra Court Richmond condos will have exclusive access to the Alexandra Club that features over 12,000 square feet of amenities. Some of these amenity spaces include an outdoor swimming pool with whirlpool, indoor gymnasium, a yoga and fitness studio, in addition to a fireside entertainment clubhouse lounge with billiards table. The new Richmond Alexandra Court condos are situated at Odlin Street between No. 4 Road and Garden City in the master planned Polygon Alexandra Gardens neighbourhood. Please visit www.polyhomes.com for more information about this upcoming release of boutique apartments. Architecture is by Robert Cicozzi. JUST OUT! Alexandra Court previews start SATURDAY, AUGUST 24th at 12 noon sharp! This vibrant community features an exciting new location and exceptional lifestyle choices for new home buyers. Close to hundreds of stores, conveniences, services, shopping and dining options in the heart of Richmond BC, the Alexandra Court apartments are also close to recreation, green spaces and beautiful parks. Great for singles to families, this Richmond Alexandra Court by Polygon condo development presents TRUE VALUE and great pricing for today’s market! The sales centre is located at 400 May Drive Richmond BC and the offer hours will be noon to 6pm starting this weekend! They are closed Fridays. It’s brought to you by Polygon Alexandra Court Homes Ltd. Exciting news! The floor plans for Alexandra Court apartments have been released! Please note that these floorplans are subject to change at any time and are only DRAFT layouts. Please visit the sales centre for more details and for print-outs! The latest collection of sophisticated residences at Alexandra Gardens Richmond is now here: introducing Alexandra Court condos. The best of the city is just minutes away including great boutique retailers, big box stores, cafes, restaurants, entertainment, and services. As well, the Alexandra Court Richmond condos are also very close to recreational venues both indoors and out. Along Alexandra Road are numerous dining options, both casual and formal and of course, Richmond shopping is easily accessible. The new Polygon Alexandra Court Condos in Richmond BC are also very close to the Canada Line SkyTrain that can take you anywhere in the Lower Mainland and to downtown Vancouver within minutes. As mentioned above, the residents at Alexandra Court by Polygon will have access to the 12,000 sf resident only clubhouse called The Alexandra Club. Recharge or swim laps at the outdoor pool or relax in the whirlpool. Enjoy a full gymnasium court for basketball, volleyball, indoor soccer or badminton year round! The Alexandra Court Richmond condo residents also have access to the exclusive yoga and fitness studios on site. Or, if you prefer the clubhouse lounge amenities, there’s a billiards room, lounge space, fireplace and much more, just seconds from your front door. Outside, there’s a lush courtyard with a beautiful water feature. In addition, there is an on-site security concierge and an impressive lobby to welcome you home or welcome your friends and family. 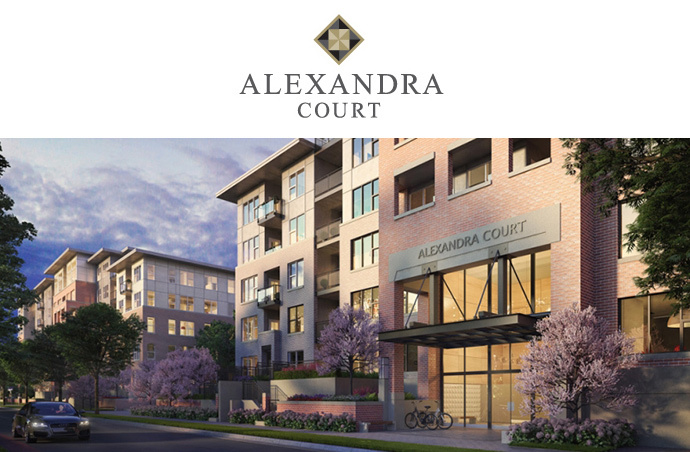 Welcome to Alexandra Court condos in Richmond, a vibrant community that offers exceptional lifestyle at an exciting location! The presales start this summer. Brought to you by Polygon Alexandra Court Homes Ltd., prospective homebuyers will find a great selection of sophisticated 1, 2 and 3 bedroom urban apartment residences in the master planned Alexandra Gardens Richmond real estate development. The launch date is set for Summer 2013 and here, condo buyers will find over height nine foot ceiling heights, central cooling system, a spa inspired master ensuite bathroom and amazingly finished gourmet kitchen with high-end brand name appliances. More information is online at www.polyhomes.com. The 100,000 square foot courtyard plus a 12,000 sf Alexandra Club amenity includes both outdoor and indoor amenity spaces that are unrivalled.